Abraham Jakub Stern (also known as Avraham Yaakov, Abraham Ya’akov, Avram Yaakov, Авраам Штерн, etc.) was born on 31 December, 1768, in Hrubieszów, a town in south-eastern Poland (from the 18th century until the beginning of the 20th century Jews made up a considerable majority of Hrubieszów's population and controlled trade, industry, and craft.) 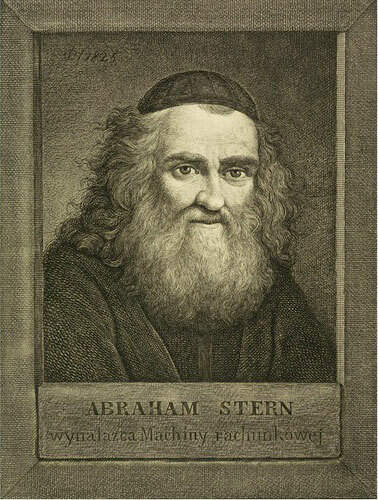 Abraham was the son of Menachem Mendel Stern (Morgenstern) (d. 1787) and Miriam Liba Stern (Halpern). Besides Abraham, Menachem and Miriam had an elder son—Yehuda Leybush Morgenstern (d. 1817). As the son of poor parents with uncertain future, Abraham received a traditional religious Jewish education in his home town, and was trained as a watchmaker. He showed, while still very young, marked fondness for the study of Hebrew books, which inspired him with a love for philosophy and mathematics. Abraham was lucky while working at a clockmaker’s shop in his home town around 1800, to be noticed by Stanisław Wawrzyniec Staszic (1755-1826, see the nearby image), a leading figure in the Polish Enlightenment: a Catholic priest, statesman, philosopher, geologist, writer and translator. Staszic, who studied at the Hrubieszów and Lublin secondary school in early 1770s, bought an estate in Hrubieszów around 1800. It was the same Staszic, who could hardly be described as sympathetic towards the Jewish community (“Jewery makes our villages poor and our cities smelly”), but he obviously noticed the extraordinary talent of the humble clockmaker and encouraged him to devote himself to the study of mathematics, Latin, and German, later sending him to Warsaw to continue his studies in mathematics, physics, astronomy, mechanics and foreign languages, and to deepen his Talmudic knowledge. 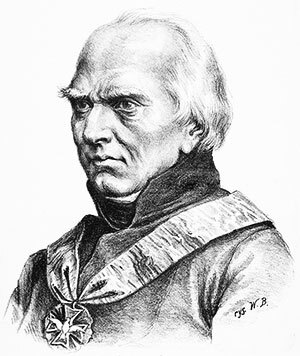 Moreover, Staszic patronized Stern intil his death in 1826. Abraham Stern was a remarkable inventor, and his inventions were known around the world, at the time of their development. His first invention was a "movable topographic machine", a kind of range finder for the surveyors. From 1810 till 1820 he designed three calculating machines (see calculating machines of Stern). Later he invented a topographical wagon for the measurement of level surfaces, an invention of great value to both civil and military engineers. He rendered great services to agriculture by his improvements in the construction of thrashing and harvesting-machines, a saw-mill, as well as by his invention of a new form of sickle. In 1835 he invented a device by which the danger of runaways could be eliminated by means of a detachable tongue and a brake. In 1827 Stern invented a machine for raising cereals, which however did not find use. In 1820 Stern presented together with Jozef Skrodzki (professor and rector of University of Warsaw) a report about the project of a chain bridge over the Vistula river. In addition to working as an official translator (he was a great expert in Hebrew and Aramaic literature, and he wrote poetry in Hebrew and translated books to Hebrew), Stern held a series of state administrative posts and functions. Since 1818, he was an assistant professor at the Dozora Elementary School for Moslems, and director of the Rabbinical School in Warsaw. From 1822 he served as a referent, and from 1825 was the chairman of the Censorship Committee of Hebrew books and writings. In 1825, Stern was appointed to the Komitet Starozakonnych (Jewish Advisory Council to the Committee for Jewish Affairs), which concluded its work with the recommendation that a reform-oriented rabbinical school be founded. Stern joined the Royal Warsaw Society of the Friends of Science, predecessor of the Polish Academy of Sciences, first as a corresponding member in 1817, then as a qualifying member in 1821, and finally as a full member in 1830. He had several successfull presentations of his calculators to the Society, but they were not fully understood by the members. In their understanding, the calculating machine was in fact nothing more than a smart toy and also too expensive to consider popularising it. Stern himself presented a completely different credo: Man's physical weakness proves that nature ordered him to work more with the force of the mind rather than the force of the body. So he should try to expand the boundaries of mechanics as it offers wealth and power to countries where it is pursued. Man should make machines and control them, and they should take his arduous work from him. Nations that developed industry rule the world, while those who neglected it have become weak, backward, poor and enslaved. Despite the succesfull career that Stern made in the capital city of Warsaw, he never lost his identity of a provincial Jew. He used to walk with a long grey beard, dressed in black satin, a silk belt, black stockings and shoes. His head had always been covered with a black velvet crimson, his brow lined with wrinkles, due to constant thinking. His bushy eyebrows hid a pair of fiery, shrewd, intelligent and beautiful eyes, and in winter and summer, among the most beautiful weather, an old torn umbrella held under his arm did not leave him. When he was staying in the castle of Prince Adam Czartoriski (yet another patron of Stern), a Jewish cook prepared his meals. Among his friends were also Count Hans Karl Friedrich von Diebitsch (Генерал-фельдмаршал Дибич-Забалканский), Count Nikolay Novosiltsev (Граф Николай Новосильцев), and Prince Radziwill (Radziwill family was connected to an earlear inventor of calculating machine—Jewna Jakobson). Abraham Stern married to Shaindla Lipshitz and they had (at least) nine children: Ber (b. 1799), Izaak (1801-1864), Eliezer, Jacob, Hanoch, Rachel, Sara Gitel (1824-1897), Esther (b. 1826), Idla. There in no doubt that Stern was a genius, but the ability to organize his affairs was completely alien to him, and his numerous family lived in poverty, once in a while supported by patrons and friends. Abraham Jakub Stern died in his home at Królewska str. 45, Warsaw, on 3 February, 1842, and was buried in Jewish cemetery at Bródno (destroyed during and after World War II).